This is Gotham. And you are Batman. The city is burning. His city is burning. Summoning his monstrous steed, the Dark Knight skilfully jumps into the Batmobile and speeds off, two parts of one seamless crime-fighting machine. As he rockets around a tight corner – a little too tight perhaps – the back of the beastly tank clips a tree, ripping it from the ground. Batman doesn't flinch, continuing his patrol of the city – but behind the PS4 controller, I grin maniacally. There's no mistaking that the Batmobile will be the centre of the Batman: Arkham Knight experience when the game launches in June. 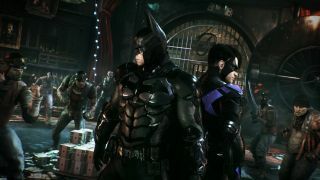 But it was also the centre of the development cycle, dictating many of the technical challenges the team at Rocksteady had while developing the final chapter in its Arkham trilogy. "The first decision we made on day-one was the Batmobile. We're going to put the Batmobile in this game," explains Dax Ginn, Game Marketing Director at Rocksteady. Perhaps what's most surprising about this admission isn't that the Rocksteady team wanted to bring the iconic vehicle into the Arkham universe, but that it was done before the team had any idea of what the next-gen consoles would be. And they knew, from the moment they decided to include the Batmobile, that they would need more power than the PS3 and Xbox 360 could provide. "We were sort of building the game with a sense of what potentially could be the horsepower of the [next-gen] consoles," Ginn admits. "Our tech guys – and especially our lead engine coder Dustin – he was building an engine that was a prediction of the horsepower that he thought the consoles [would have]. And then when we finally got our hands on the hardware, he was like "Yeah, no worries, I always knew it was going to be this way". As a result, there wasn't a huge amount of scaling up or scaling down the project to fit the hardware limitations of the PS4 or Xbox One consoles. But more importantly, it allowed Rocksteady to deliver on its dream of a fully realised Gotham, where the Batmobile is not just a cameo, but a full-fledged character of the game in its own right.